After our Green Schools Committee was set up we decided to carry out a review of the school and grounds in order to identify areas that we could take on as part of our Green School programme. A group of Transition year students decided to undertake the analysis of the waste bins as part of the environmental review. The bins in all the classrooms and main assembly area were selected and these students emptied these on Wednesday 1st December 2010. They calculated that paper was found in 87% of the bins!! All this paper was going to landfill instead of being recycled. The Committee decided to put “paper-only” recycling bins in each classroom, the main assembly area, on corridors, in offices, the staff room and the staff workroom beside the photocopier. We decided to start with paper recycling because the percentage of paper in the general bins examined was so high. We also decided to put one bin in the assembly – the place where a number of students eat lunch – which was specifically for plastic bottles. The Committee asked Mr. Gildea the Principal for permission to purchase the bins needed. As a result of monitoring how many general waste bins are being collected per month we discovered that in the two months after classroom recycling was introduced – April and May 2011 – only two bins per month were left out for collection. In the preceding three months three bins per month were being left out. That means that we saved a total of 58 euro in the two months after recycling had been introduced. As a lead up to our Action Day we ran a Green-Schools awareness month. This month began on the 26/09/11 and ended on the 21/10/11. The aim of this month was to increase the awareness of the Green-Schools programme throughout the school. It also gave time for teachers to make links with the national curriculum and Green-Schools. Lots of Green-Schools activities happened throughout this month. A group of transition year students collected unwanted recyclable items from classrooms on Tuesday 11th and Friday 14th October. These items were reused and recycled on the Action Day. Two 3rd year classes, aprox. 30 students, visited the Coolmine Recycling Centre and were brought on a tour of the facility. Patricia Kennedy from Fingal County Council met our Green-Schools Committee and discussed the programme in detail. All 1st and 2nd year students attended Anti-Graffiti workshops on the 10th and 11th October in our school library. Lampposts on the school grounds were re-painted to help improve the appearance of our school. Work on the Herb Garden was completed. Our Action Day took place on the 18th October 2011. The aim of the Action Day was to highlight all the work the Green-Schools team had carried out since last year. This day celebrated the pupil’s work. It also allowed us to raise awareness of Green-Schools within and beyond the school. All students, staff and committee members were involved. Winners of all the Green-Schools competitions were announced on the day. Competition entries were displayed in the main assembly area and pupils were brought here throughout the day to view all the work produced. The winning Green Code was announced over the intercom. Before and after photos of all the ‘old’ litter spots in our school were displayed. The Principal awarded all prizes to the winning students in the school library. Teachers wore green to work on this day. The Herb garden was officially opened by our Deputy Principal. Students and teachers involved in the creation of the garden were invited to the opening and tea, coffee and sandwiches were served afterwards. We were delighted that a past staff member, Sister Breda Hanrahan, attended the opening of our new garden. Sister Breda had set up the first environmental group – ‘Care for the Earth’ – in Riversdale Community College in 1995. She led this group for many years and they worked tirelessly to highlight the importance of the environment in our school. She was really impressed by all the actions and changes carried out so far. A group of transition year students planted spring bulbs and flowers were planted near the front door of the school to celebrate the 25th anniversary of our school. The new sign for our Green Schools notice board was unveiled. This sign was made from recycled materials by a 2nd year Art class. The awareness month and Action Day were very successful and created a real buzz throughout the school. We felt everyone had the chance to get involved and we believe awareness of the programme greatly increased. A number of competitions were held to raise awareness of the programme throughout our school. Design a Poster on the Theme of Litter and Waste. Make an Item of Clothing out of Recyclable materials. Choose a Waste item, find a new use for it and decorate. Submit a Green Code for Riversdale – which shows our commitment to environmentally friendly actions. Riversdale Community College achieved a significant milestone by raising the school’s first Green Flag in January. The official ceremony was conducted by Minister for Transport, Tourism and Sport, Leo Varadkar on his recent visit to the School. 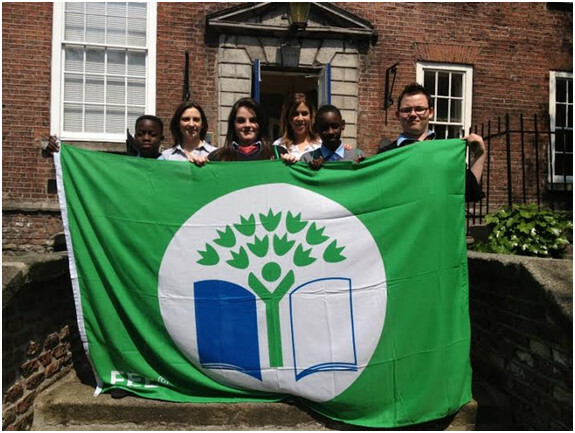 Collecting the flag in May 2012 are students Plamedi Dionga, Robyn Kelly, Leon Ncube, Reece Johnson, with teachers Eimear O Donovan, Anne Mulhall. 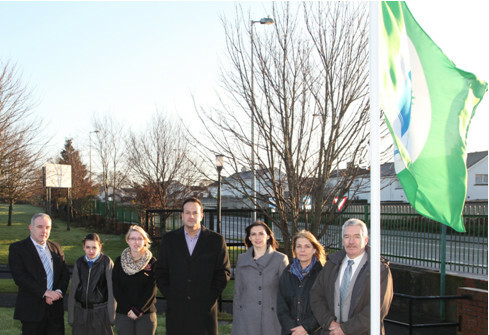 The flag was officially awarded to the school in May 2012 by an Taisce. This followed two years of hard work and dedication by students and staff to the Green School programme. The theme for the flag was litter & waste. The committee was headed up by teachers Eimear O Donovan and Anne Mulhall. Students got enthusiastically involved in the project with representatives from each class on the committee and several teachers too. After a review of the litter & waste in the school it was decided to introduce a new bin system. This has worked successfully throughout the building. In addition to this courtyards were cleared out and given a new function. A sensory garden was created by Chaplin Susan Robinson with help from a creative group of transition year students. Junior students also got involved in helping Ms. Thompson create a wonderful herb garden as part of the garden project. The school is very proud of its achievement. The Green flag has enhanced the school’s environment, with garden courtyards, an eco-conscious community and a user friendly recycle programme. A proactive student and staff body remain determined to ensure this positive experience continues. Work has already begun this year on the second flag; the theme is energy. Well done and thanks to all involved.